Lounging poolside with a refreshing cocktail in hand never felt as heavenly than when in Veligandu, Maldives. Slide in the sun-drenched fresh cystaline water, and bask in the captivating view in front of you as the infinity edge smoothly blends in with the ocean skyline. 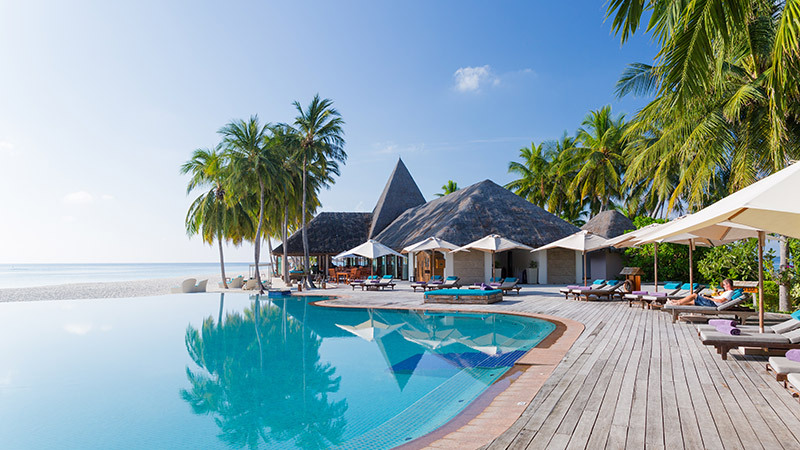 The infinity swimming pool is adjacent to Thundi Bar, just a step away from the shoreline and offers all the essentials for a carefree afternoon under the Maldivian sun. Enjoy sunbathing in luxurious comfort, including comfortable loungers, mesmerising view over the lagoon and a fantastic menu of snacks and refreshments to savour as you wile away your day. After sundown, visit the poolside bar and take pleasure in one of the most romantic sights imaginable: the illuminated night sky, painted with a million twinkling stars.